The secret behind AlgaeCal’s proven bone-building formula is a unique strain of plant-based red algae found on the shores of South America — Lithothamnion superpositum. This algae belongs to the family of algaes known as Algas calcareas. Algas calcareas is a red ocean algae, different from better-known species like freshwater green or brown algae (blue-green, spirulina, chlorella, etc). Typically, red algae are found in tropical marine areas; very few are found in freshwater. Red algae is generally more complex than most other algaes, both at a cellular and structural level. These kiwi-sized balls of living algae attach to seaweed on the ocean floor. The Algas calcareas naturally detach from the seaweed and eventually wash ashore where they can then be sustainably hand-harvested. In this age of technology, why would we hand-harvest rock-hard algae? It’s not like we need to be gentle with it, right? Well, it’s all about preserving the supply and the delicate ecology of the water. Algas calcareas has a 180-day lifecycle. It attaches itself to seaweed on the ocean floor and hangs out for six-months, just growing and doing its own thing. Eventually, the then kiwi-sized algae detaches from the seaweed and washes ashore. That’s the key part — the algae washes up onto the beach naturally. Because the algae comes to us, we don’t have to dredge it out of the ocean. Dredging disrupts marine life and unsettles the ocean floor, which negatively impacts the area’s ecology. So, to limit our impact on the area, the algae is harvested by hand from the shores of a remote area in South America. We employ a team of trained locals who live-harvest this marine algae from the beaches at low tide within 48 hours of being exposed to the sun. This ensures all of the minerals and nutrients are intact. The crop is rotated from beach to beach to be sure to not interfere with the natural cycle of marine algae. After it’s collected, the marine algae is washed with fresh ionized water and then sun-dried. The algae is then milled down to powder form to become the raw version of AlgaeCal. To ensure quality and safety, every batch of AlgaeCal powder is tested for microbial activity and mineral content. There is no chemical treatment, no sieving process, and no additives or extractions that might create impurities in the raw form. Algas calcareas is a completely natural product. But you may be wondering how these innocuous little algae become linked to bone health. Well, to understand that, let’s go back to where it all began in 1973 — to a steel mill of all places. It all started with an experiment using marine algae in steel manufacturing. Dr. Marcos Norman, a mechanical engineer at Morris Kwugsem International (MKI), recommended Algas calcareas be used in a novel way. MKI engineers in America needed to reduce fusion temperatures in their steel manufacturing. At the time, they were using oyster shell calcium with some success. Dr. Norman, having grown up in South America, recommended they try a local marine algae that washed up on the shores right in front of his home. That algae, of course, being Algas calcareas. Norman figured the algae might hold up better against fusion temperatures than oyster shells. Sure enough, to everyone’s amazement, this mineral-rich algae dropped fusion temperatures from 1,700 to 1,300 degrees! Dr. Norman became so fascinated with the versatility of this mineral source, he left MKI to begin studying Algas calcareas to see what else it was capable of. When Norman returned to his roots in South America, he began experimenting with agricultural applications. At one point he found Algas calcareas’ nutrient-rich complex could restore minerals and microbes in soil. This was a boon for fertilizer companies, who purchased tons of fossilized marine algae sands each year. Because of the results, many fertilizer companies now prefer South American marine algae over traditional chemical fertilizers. 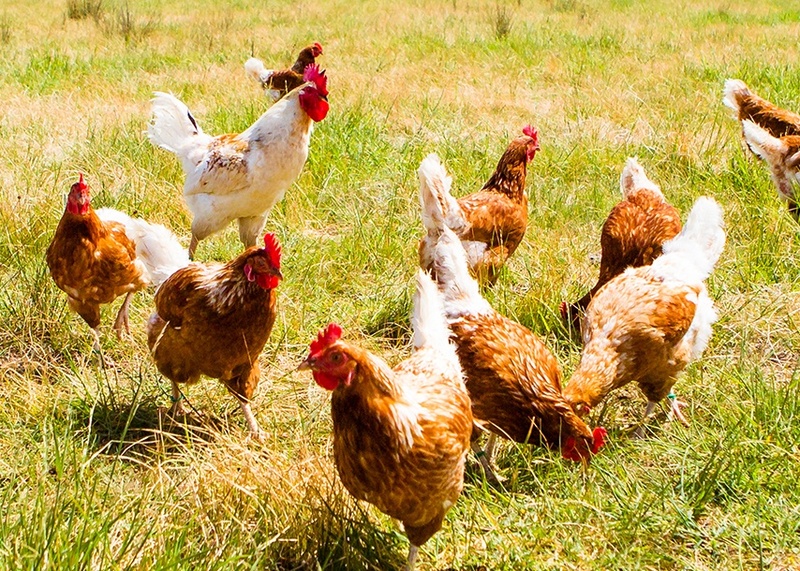 Back in the mid-’80s, the Japanese government banned the purchase of South American poultry due to high residual antibiotics and growth hormones in the meat. In response, researchers at Poznań University of Life Sciences in Poland conducted a two-year study to see the effect South American marine red algae might have in replacing the antibiotics and growth hormones in chickens. Results showed the red algae produced similar growth to the growth hormone, except the chickens were very energetic, exercised more, and developed into a higher protein/lower fat bird. Additionally, the birds’ health was fortified by the algae in their feed, so antibiotics became unnecessary. This study was reviewed on South American national television in 1986. It’s not only humans and birds feeling the positive effects of Algas calcareas. Cows have even produced more and healthier milk. 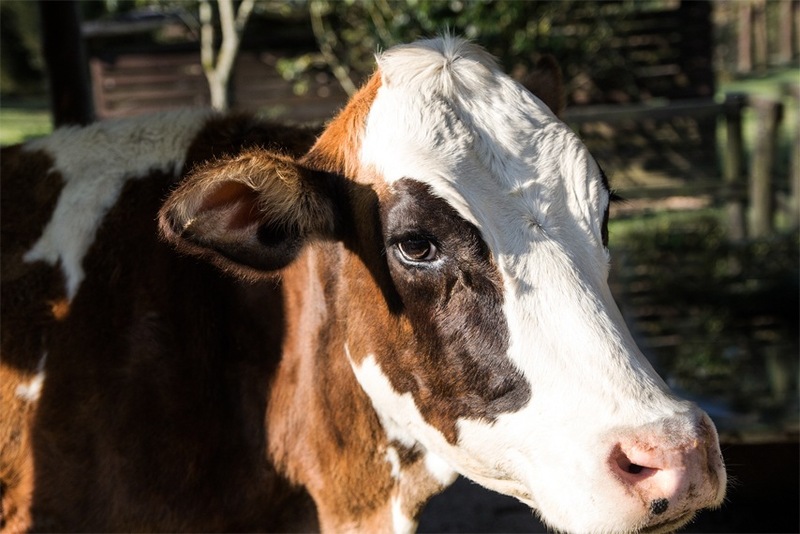 In one 2015 study, six Holstein cows were each given three different feed mixes. Each feed mix had its own dietary addition to see which had the greatest effect on milk production and composition. The control feed had calcium from limestone, just like your typical calcium supplement. The second feed had sodium bicarbonate. And the third feed had a red marine algae in the same family as Algas calcareas, called Lithothamnium calcareum. It took half the amount of red algae to produce better results than the sodium bicarbonate-infused feed. And the limestone feed overall had the worst results. By this time, human consumption of marine algae was well documented. It didn’t matter whether the benefits were from well-known algaes like spirulina and chlorella, or red algae like in AlgaeCal. Studies showed the great antioxidant properties of marine algae. But it wasn’t only that. Algae proved to be a well-rounded source of vitamins, minerals, protein source, and more. As algae’s multi-functional benefits became better known, even food companies were getting in on it. Novel new lines of food products began including microalgae to appease more health-conscious consumers. Pastas, breads, and dairy products were all starting to get infused with some microalgae or another. Of course, this all led to today’s focus on dietary supplements with different algaes. In fact, you’ve probably seen generous portions of health food stores’ shelves stocked with spirulina, chlorella, and other algae-based powders and pills. So what about humans and AlgaeCal? Since 1977, Dr. Norman helped pioneer Algas calcareas use for those needing a calcium and mineral supplement in South America. He was already convinced of its many health benefits then — long before the overwhelming scientific proof of its effectiveness we have today. So one day in April 2004, Dr. Norman contacted AlgaeCal Inc. CEO Dean Neuls to tell him about his breakthrough discovery in his own backyard. At the time, Neuls was selling a coral calcium product online — back in the coral calcium heyday. When Neuls heard of this new use for Lithothamnion superpositum, he got on a plane and flew down to South America as fast as he could. He needed to see these kiwi-sized balls of organic calcium for himself. Little did he know the effect those purple-red orbs would have on folks with weak bones. And the rest, as they say, is history. Since obtaining the worldwide exclusive rights to this superfood calcium source (the most mineral-concentrated plant on earth), there have been several studies done on Algas calcareas. And those taking it have also reported positive, surprising outcomes too. For instance, AlgaeCal products have been linked to a variety of health benefits, including denser bones, smoother joints, lessened pain, healthier circulatory system, and increased energy. 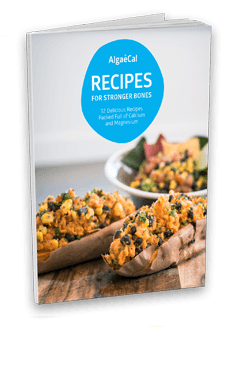 But most importantly (and probably why you’re here), is the proven bone density increases. Human clinical studies show that AlgaeCal products increases bone density, rather than just slowing bone loss like traditional calcium supplements. 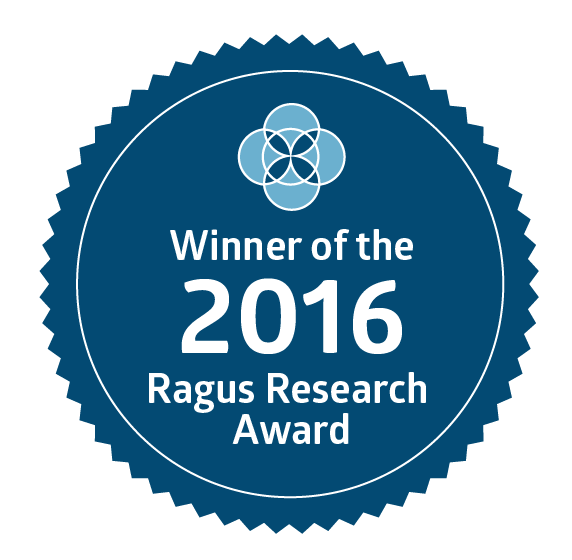 The first study that proved we were on to something with AlgaeCal Plus was published in the Nutrition Journal. In a study of 216 women and men, researchers found that AlgaeCal formulations increased bone density over 2% on average, annualized over one year. In this study, there were two different bone-health regimens followed for six months. Group 1 took AlgaeCal Plus with vitamin D3. Group 2 took AlgaeCal Plus with Strontium Boost, together known as the Bone Builder Pack. After six months, both groups gained “significant” increases in bone mineral density (BMD) compared to the expected bone loss for each individual’s age. This bone growth was flat-out shocking, because as you may know, we lose about 1% of our bone each year after age 40. So BMD increased, but were there any adverse effects from either regimen? To gauge safety, a panel of 43 blood tests and a quality of life questionnaire were used. Compared to pre-study baseline scores, there wasn’t a single adverse effect in either group after six months of treatment. Now, one promising study is great. But we wanted to confirm AlgaeCal’s effectiveness again, and only on postmenopausal women. So we had 414 women separated into three groups. Each group received AlgaeCal Plus with differing amounts of vitamin D3. One group was also given Strontium Boost along with the D3. After the 12 months, the lowest average BMD increase was 1.3% — from the AlgaeCal Plus and 1,000 IUs of vitamin D3 group. And the highest average BMD increase group? Well, they enjoyed a stunning 4.10% increase in healthy, new bone. That group took AlgaeCal’s Bone Builder Pack of AlgaeCal Plus and Strontium Boost, along with 600 IU more vitamin D3 than the lowest increase group. So this study produced great news again. But the next question was: could these increases in BMD continue into the future, for longer than 12 months? Study #3, published in the Journal of the American College of Nutrition, revealed the answer. 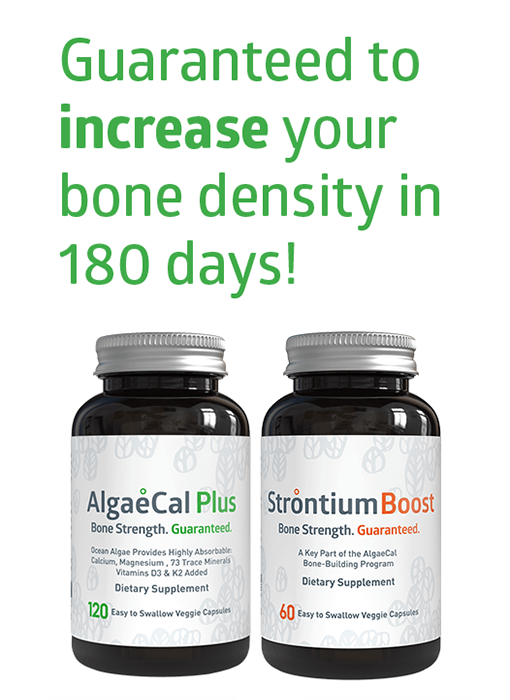 The study followed 172 women in their mid-60s, taking AlgaeCal Plus with Strontium Boost (our Bone Builder Pack) for seven consecutive years. average increased BMD a stunning 7.3% over seven years. And that 7.3% was consistent — the women enjoyed an average 1.04% increase each year. When the study was released in February 2016, these results were unheard of. Keep in mind, traditional, rock-based calcium supplements at best could only slow annual bone loss — never mind halt or even reverse it. But here was AlgaeCal Plus and Strontium Boost adding healthy, new bone to the 172 participants. And gains came without any adverse effects, as reported by a panel of 45 blood chemistries drawn at baseline and ending. There is no other calcium supplement on earth that can accomplish the same feat. Now that you’ve discovered Algas calcareas and its proven bone-building science, you can see why it’s the calcium of choice. 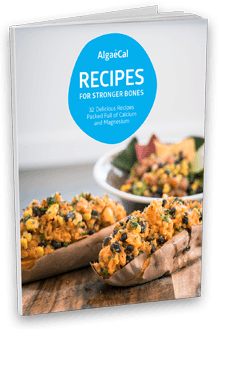 And why it’s the key ingredient behind the natural bone mineral density increases you just read about. AlgaeCal holds the exclusive worldwide rights to this superfood plant calcium. 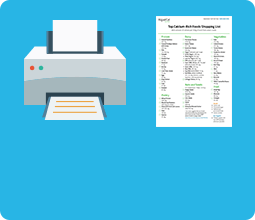 All our direct-to-customer sales are made online and over the phone, so if you’re looking for AlgaeCal Plus on store shelves, you won’t find it there. Nature knows best, and in this case, AlgaeCal is our planet’s human bone doppelgänger. 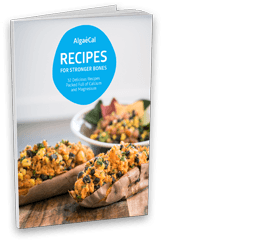 Healthy bone and Algas calcareas have nearly identical mineral compositions. 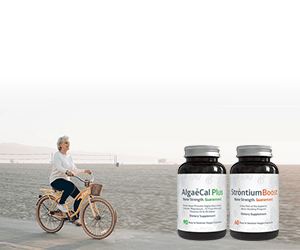 So if you’d like to reverse bone loss and rebalance the delicate mineralization in your bones, check out the full range of AlgaeCal products here.